Hey everyone! 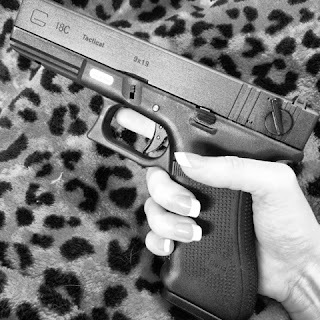 This article is my thoughts on the WE Gen 4 Glock 18C GBB pistol. In January I went to my local airsoft store with my birthday money in hand to see if anything there caught my eye! Whilst looking at Pistols in the glass cases, I came across the WE Glock 18C. I think you may have gathered that aesthetics are very important to me when it comes to my gear, I like it to be colourful with matching attachments - gone are the newbie days where I would attach black accessories to my FF26 Pink Storm! Although it's not a colourful gun, I've seen lots of people on Instagram getting them Hydrodipped or Cerakoted in gorgeous shades such as Tiffany blue so the possibilities for this gun and really making it my own were plentiful. The Glock 18C has clean lines and isn't too fussy. It comes with 2 sets of different back grips so it's very ergonomic and fits nicely in your hand. I have kept the original set on. 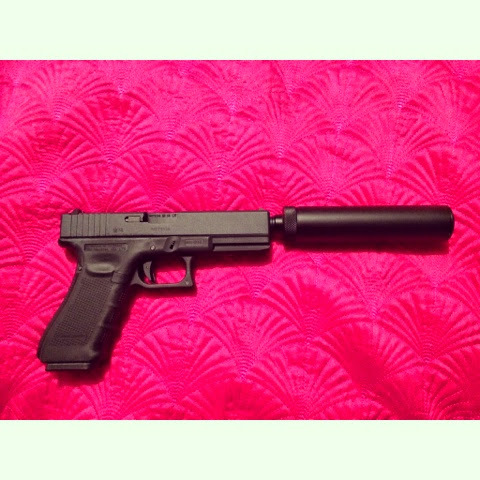 The attachments I chose for my Glock are a mock suppressor, for this I needed a clockwise to anticlockwise adapter which works fine however it does work itself loose over time - I just make sure to tighten it up before a skirmish. I am also hoping to get an under barrel torch and maybe a red dot? I'm not sure about the red dot. We'll see haha! This is my Femme Fatale loadout, which I plan on running at Tac House this weekend! 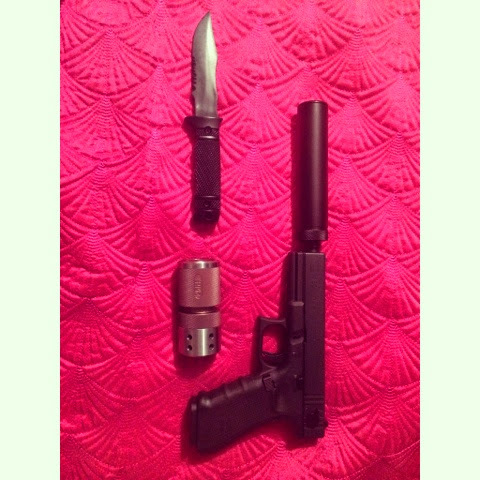 My Glock, TRMR and a knife for some tacticool knife kills!